When chestnuts season has come,chestnuts gatherring memories are come back over 30 years. I experienced a large crop for the first time in my life. I can't forget the excitement on that time .
" Are there any memories concerning chestnuts ? " A woman said the story concerning birth of her daugter. her father gave baby chestnut tree on celebration. We talked about her father's wish. We wondered if he wished not being hungry her whole life. concerning manners and customs the New Year in her childhood. chopsticks of chestnut branch were displayed. I consulted the property of chestnut tree. Chestnut tree is very hurd and used for base or pillar of house. I watched TV program " The remains of Sannai maruyama "
At the Sannai maruyama, chestnuts were grown.and big tree of chestnut were used for pillar of house. 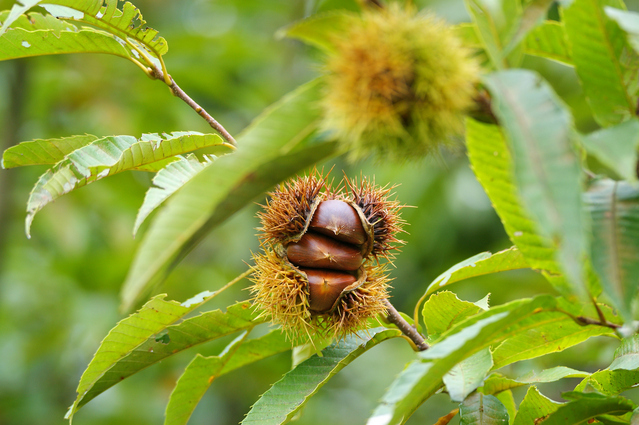 Chestnut tree has been absolutely necessary for human life as foods and as building materials. I understood that chestnut tree was whole-hearted present for granddaugter from grandfather.